We strive to prepare each child for a successful kindergarten experience both academically and socially. Everything we do is designed to maximize your child’s learning in a fun environment. Below are just a few of the learning activities throughout the year your child will experience when attending Sunshine Learning Center. When you come for a visit please ask us for our time line that breaks down the schedule for the year. Circle time where the children learn the pledge of allegiance, talk about the day’s weather, the calendar, and what we will be doing for the day. During this time we count 1-100, work on number recognition, learn to graph, start on vowels, phonics, and positional understanding just to name a few of the activities to prepare students for kindergarten. These are just an example of the learning activities throughout the year. When you come for a visit please ask us for our time line that will break down the schedule for the year. As the year progresses we continue with AB patterning, sight words, picture patterning, word families, writing, and math, such as tally marks and addition. Each week we have a weekly theme, science, music, art, dramatic play, Spanish, Bible story activities, and outside fun. Get a Head Start Today! 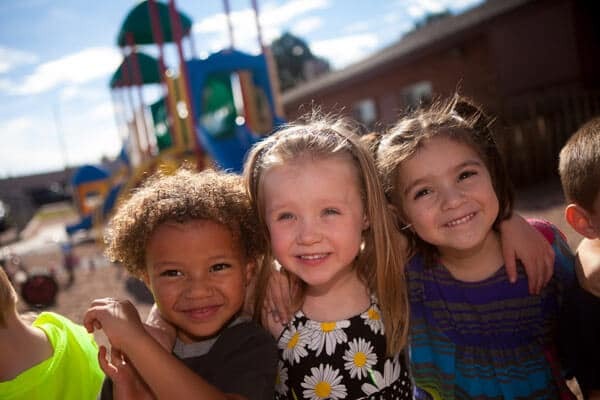 Give your child the best jump start to kindergarten with one of the best Colorado Springs preschool. Call Sunshine Learning Center today to learn more about how to enroll your child.